Gain the insight of studying the Bible in its original language without knowing Greek or Hebrew. Simply tap a word and read the definition in a pop-up window. You can also search for other uses of the word in the Bible and look up related articles. This is so much more than a traditional dictionary. While you're reading the Bible, the Resource Guide will pull up articles from this dictionary. You can also select words in the text and tap "Look Up" to access relevant information in a pop-up window. 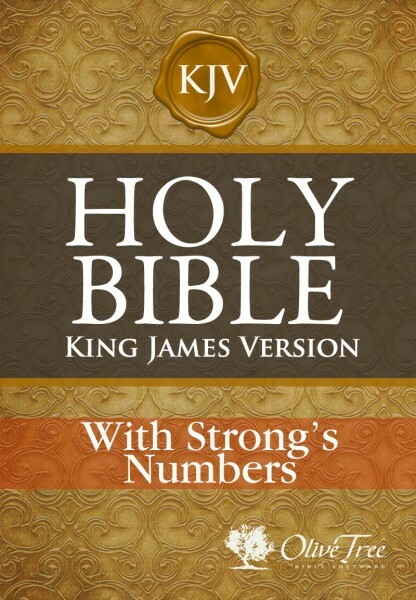 The KJV with Strong's Numbers includes the text of the KJV and Olive Tree's Enhanced Strong's Dictionary (with words in both the original language and transliterated form). The King James Version (KJV) is an English translation of the Holy Bible, commissioned for the benefit of the Church of England at the behest of King James I of England. First published in 1611, it has had a profound impact not only on most English translations that have followed it, but also on English literature as a whole. The KJV Bible text can be viewed with or without the inline Strong's. When only the text is displayed on the screen, the user simply taps a word to display the dictionary information. When the text and the numbers are displayed, tapping a number will accomplish the same thing. Used in Olive Tree's apps, the Strong's numbers can be used to generate powerful search results essentially equivalent to what Strong's Exhaustive Concordance and Wigram's Englishman's Greek and Hebrew Concordances provide. An excellent resource for readers who want to go a little farther in their study of the scriptures. From Online Bible with permission.